Nick Price and a fine Bahamian bonefish. The connection between golf and fly-fishing first struck me 10 years ago, when a fishing guide recounted a day when he had taken Tiger Woods and Mark O’Meara out on the Deschutes River in Oregon to cast flies for steelhead. As my friend recalled this special day on the river, I noted that many golfers I know fly-fish, and vice versa. Perhaps it’s the outdoor setting, pitting man against an indifferent if not inimical nature, be it in the form of finicky trout or gaping bunkers. Perhaps it’s the similarity of the motions of swinging and casting — the fact that the ball or fly goes farther when you move smoothly. Love said it was the lakes on golf courses that got him interested in fishing. He began dabbling in fly-fishing because several other players on the PGA Tour, especially O’Meara, Jack Nicklaus and Paul Azinger, enjoyed it. Love has fished in places like the Bahamas and Silver Creek, in Idaho, but his current favorite fishing spot on the tour is the Blue Monster at Doral, near Miami. For Nick Faldo, golf and fly-fishing are intimately connected. He said he became interested in fishing in 1986 when he was changing his swing. “My doctor took me down to the River Test in the south of England to give me a break from the range,” Faldo said. “There’s a famous mayfly hatch that occurs on the Test at that time, known as Duffers Fortnight. If you can’t catch a fish then, you’ll never catch one. I was hooked. “I find fly-fishing completely engrossing. I love the tranquillity, the sound of the river. When you come upon a rising trout that’s picky and you have to try six different fly patterns to get him to take, 30 or 40 minutes will fly by, and that fish has had your complete attention. When you’re fishing, you’re not clock-watching. You get lost in time. Pro golfers, Price added, appreciate the solitude of fly-fishing. 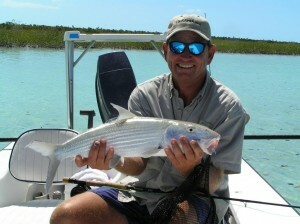 Ben Crane, a four-time winner on the tour, described fly-fishing as a “mental vacation” from the grind of the golf tour. “Playing on tour can be a little one-dimensional, as you’re constantly on the road, thinking about one thing: golf,” he said. But when he is fishing, Crane gets to think about something else. “When I’m out there, I think of only one thing for seven hours: what is the fish thinking?” he said. “You still have to be very focused. Where’s the fish holding? What’s the depth of the fly? Is it the right fly?